You have either gone with a Business Partner or are still with IBM. Either way you should still be receiving the software in a Box. If you aren’t then you need to contact your sales rep. Or if you feel disenchanted there as well because of all the moving around then let me know and I’ll see what I can do to help you out. 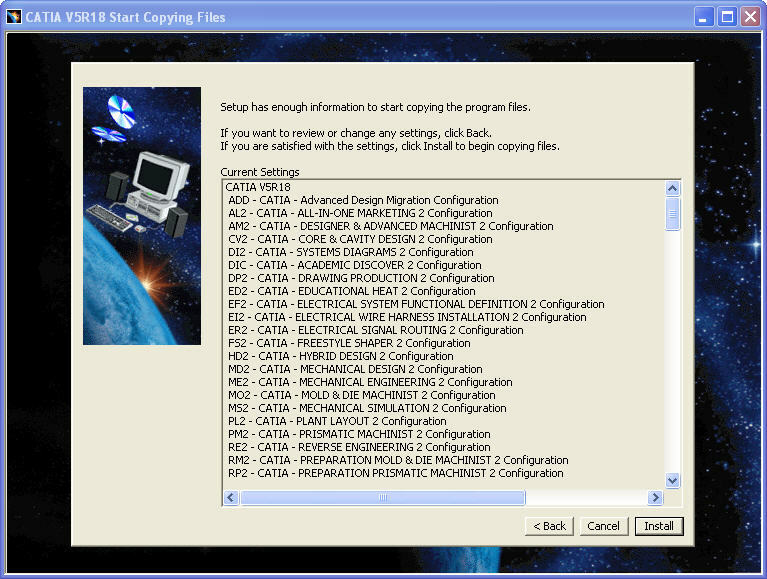 So if you look inside of your CATIA Box you will see many different CD’s. The ones you will want are the ones that are Labeled ‘CATIA Software Windows’ There are going to be 2 CD’s and 2 Sets of CD’s. One set is going to be for 32bit systems and the other is going to be for 64bit systems. Take out the ones that are for your system and set them aside. Then get the service pack that you are going to load and set that aside as well. The easiest way to do this is to just start clicking Next >. But this will help you setting up the other installations. Next take the 1st CD and place it in the CDROM/DVD Drive. One of two things will happen. Either the installation will start and prompt you to select OK or you will have to open a Windows Explorer and go to the drive where the CD is located and double click on the Setup.exe. The CATIA V5R## Welcome Screen will appear. You will need to select Next > to continue. 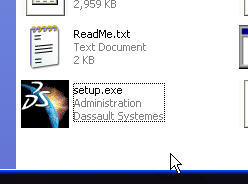 C:\Program Files\Dassault Systemes\B##. You can choose where ever you want to by either typing it in or by selecting browse and surfing to the new location. If you don’t have a preference where it gets installed then select Next >. If the Directory doesn’t exist then CATIA Will ask to create the directory. Select Yes here. Skip this step if you aren’t installing another installation of the Same Version of CATIA on to this machine. For those of you who have the same version of CATIA Installed on your machine then you will be asked to select a string that will help identify this installation. Input the new Ident: and select Next >. I have always done what I call the JimO method here. Install Everything. Hard drive space is super cheap now. These aren’t 4gig drives anymore. Orbix is used for the Enovia Products. With our CATIA Installation we aren’t to concerned with it. Go with the Defaults. 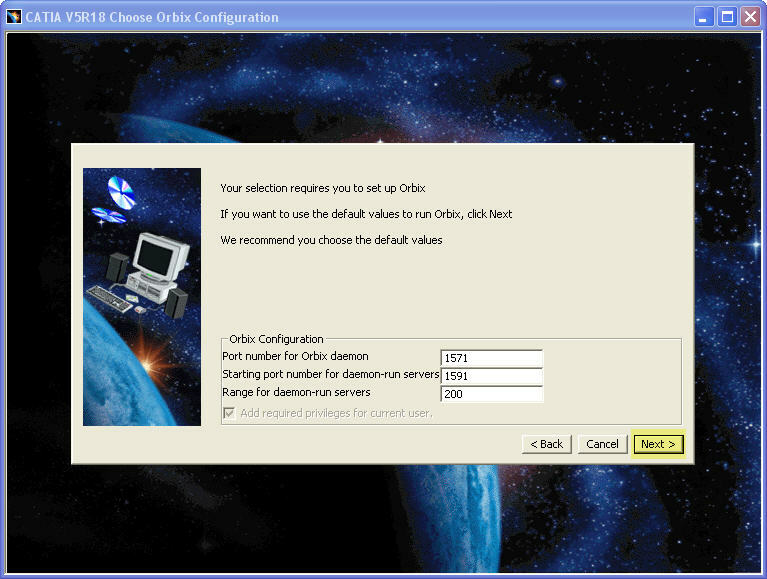 The Server Timeout Configuration is used for the Enovia Products. With our CATIA Installation we aren’t to concerned with it. Go with the Defaults. Here CATIA is asking you ‘If you are going to install the Enovia Vault Client do you want to have CATIA Prompt you at the end of the CATIA Installation to install it?’ We are going with the defaults here again and not installing it. Select Next >. If you do not want a Desktop Icon or an Icon in the Menu bar or don’t want to create a Tools Menu in the Start Menu the you will need to uncheck the boxes that correspond to what you don’t want to see. After reviewing you will need to select Next >. Don’t think on this to much as they can all be either recreated or removed. Here again CATIA is helping you out. 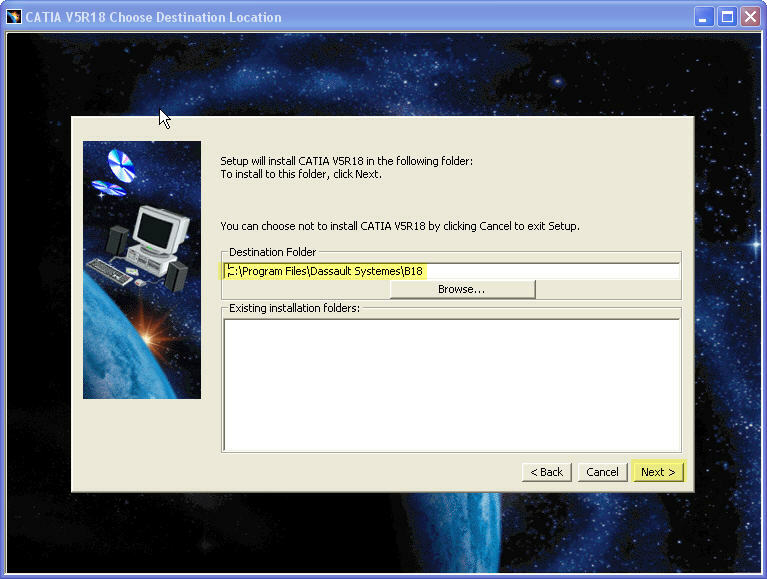 It is Prompting you to install the Documentation after the CATIA installation. If you want select OK other wise keep on going. But do remember if you select OK have the CD’s Handy. We are finally done with our configuration. Here is where you review what you just selected. You can drag down through this panel and verify what you have selected and select Next > or just select Next > if you are confident in what you have defined. 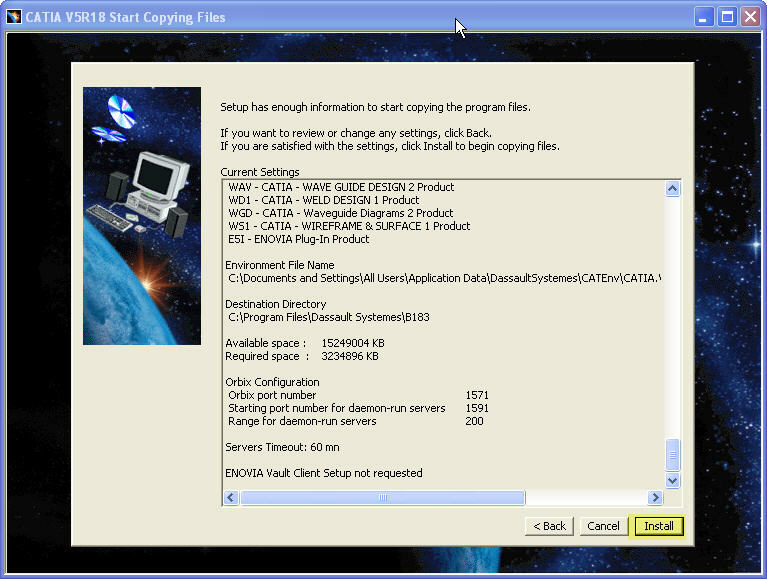 There will be OLE Links and Entries in the Registry for Removing CATIA. 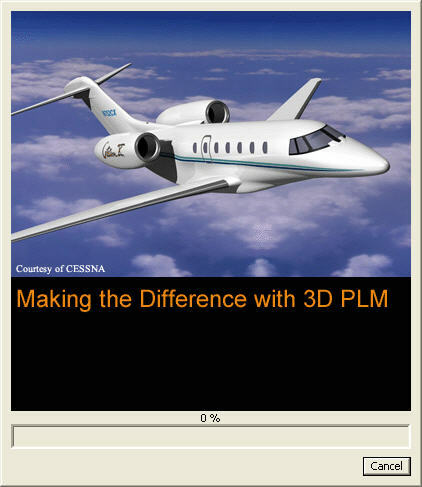 Any Additional Fonts that are required by CATIA will be added. After the installation is complete and if you selected the Doc’s to be installed after installation and they are done as well you will need to install the Service Pack. We will be covering Service Pack Installation next week.